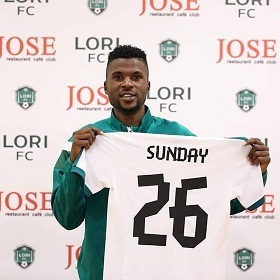 Plateau United midfielder Sunday Ngbede has signed a three-year deal with Armenian club, F.C. Lori for an undisclosed fee. The player's movement was finalized with his parent club FC Learning of Bukuru who loaned him out to the Nigerian Champions. Sunday Ngbede has played for Plateau United in the last four seasons.and played a pivotal role at helping the Peace Boys to clinching the Nigeria topflight tittle last year. He is expected to join four other Nigerians,Deou Dosa,Ekereke Ekemini, Ugochukwu Iwu, Ias Aliyu and Etop Udoh at the Club. Learning FC Chairman, Hon. Emmanuel Davou Gyang who spoke with allnigeriasoccer.com confirmed the movement and said Plateau United will also benefit from the deal. FC Lori are currently third on the log of the Armenia Premier league closely behind Pyunik and Ararat-Armenia.